Genesis chapter 40 Star Chart: Since "two full years" passed (41:1) till "Joseph was thirty years old when he stood before Pharaoh" (41:46), and he was "seventeen years old" (In 1683 B.C. -- cp. Gen. 29:22) when sold into Egypt, we know that 13 years elapsed till he stood before Pharaoh in 1670 B.C. That makes this butler-baker incident in chapter 40 occur in 1672 B.C. Clockwise from when "they dreamed a dream both of them, each man his dream in one night, each man according to the interpretation of his dream, the (Aquarius) butler (cupbearer) and the (Capricorn) baker of the (Cepheus) king of Egypt, which were bound in the prison" (40:5) till "within three days shall Pharaoh lift up thine head, and restore thee unto thy place: and thou shalt deliver Pharaoh's (Crater) cup into his hand, after the former manner when thou wast his (Aquarius) butler" (cupbearer)(40:13) is three 12-hour days totalling 36°. And to the (Capricorn) chief baker he said "within three days shall Pharaoh (Cepheus) lift up thy head from off thee, and shall hang thee (lunar noose) on a (green Milky Way) tree; and the birds (Corvus & Cygnus) shall eat thy (Virgo) flesh from off thee" (40:19) "in the uppermost (lunar) basket" (40:17). 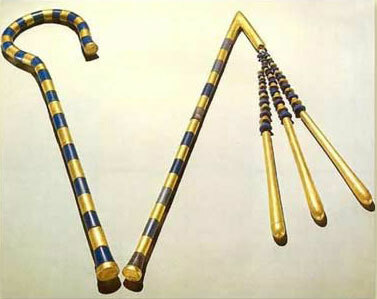 The CROOK was a (red radius) cane with a (lunar crescent) hooked handle, sometimes gold-plated and reinforced with blue copper bands. It probably derived from the shepherd's crosier. The FLAIL was a (red radius) rod with three attached (lunar) beaded, strands. It possibly derived from a shepherd's whip or a fly whisk. 40:1 And it came to pass after these things, that the (Aquarius) butler of the (Cepheus) king of Egypt and his (Capricorn) baker had offended their lord the (Cepheus) king of Egypt. The word is rendered in Nehemiah 1:11, “cupbearer,” an officer who looked after the king’s cellar. 2 And Pharaoh was wroth against two of his officers (Aquarius & Capricorn), against the chief of the butlers, and against the chief of the bakers. 3 And he put them in ward in the (red radius) house of the captain of the guard, into the (red radius barred) prison, the place where Joseph was bound. 5 And they dreamed a dream both of them, each man his dream in one night, each man according to the interpretation of his dream, the butler (Aquarius) and the baker (Capricorn) of the (Cepheus) king of Egypt, which were bound in the (red radius barred) prison. 6 And Joseph came in unto them in the morning, and looked upon them, and, behold, they were (lunar black crescent frown) sad. 7 And he asked Pharaoh's (Capricorn & Aquarius) officers that were with him in the ward of his lord's house, saying, Wherefore look ye so sadly to day? 11 And (Cepheus) Pharaoh's (Crater) cup was in my (Aquarius) hand: and I took the (lunar and solar) grapes, and pressed them into (Cepheus) Pharaoh's (Crater) cup, and I gave the (Crater) cup into (Cepheus) Pharaoh's hand. Herodotus relates of the Egyptian priests, that wine pressed out of the vine is given them: Euterpe sive, l. 2. c. 37. 13 Yet within three days shall Pharaoh lift up thine (Virgo) head, and restore thee unto thy place: and thou shalt deliver (Cepheus) Pharaoh's (Crater) cup into his hand, after the former manner when thou wast his butler. 17 And in the uppermost basket there was of all manner of bakemeats (pastries, tarts, pies) for Pharaoh; and the (Corvus, Cygnus) birds did (red radius) eat them out of the (gibbous lunar) basket upon my (Virgo) head. 19 Yet within three days shall Pharaoh lift up thy head from off thee, and shall (red radius rope with lunar noose) hang thee on a (green Milky Way) tree; and the birds (Corvus, Cygnus) shall (red radius) eat thy flesh from off thee. 20 And it came to pass the third day, which was Pharaoh's birthday, that he made a feast unto all his (constellation) servants: and he lifted up the head of the chief butler (Aquarius) and of the chief baker (Capricorn) among his servants. Proclamations of amnesty on royal birthdays have been universal. They can be illustrated from the royal proclamations preserved in Egyptian inscriptions. 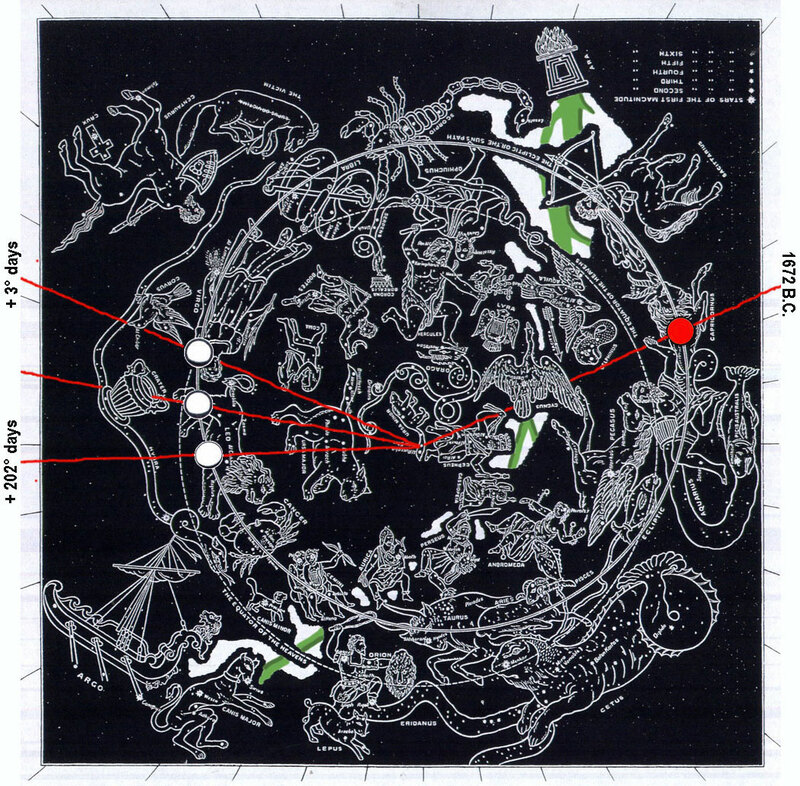 22 But he (red radius rope with lunar noose) hanged the chief baker (Virgo): as Joseph had interpreted to them. 23 Yet did not the chief butler (Aquarius) remember Joseph, but forgat him. Why doesn't the Bible mention the birthdates of such men as Abraham, Moses, David and	even Christ our Lord? Is the day of one’s birth of any great importance? Only two birthday celebrations are mentioned in the Bible. A Pharaoh in Egypt celebrates his birthday by hanging his chief baker (Gen. 40); and Herod, on his birthday, grants the request of the daughter of Herodias and orders John the Baptist beheaded (Matt. 14:6-10). An execution occurred on each one! The children of Job may have been celebrating the birthday of the eldest son, when, by God’s express permission, Satan caused a great blast of wind to collapse the house upon them, killing all ten (Job 1:4-19). Job had been concerned about these activities of his children. After their feasting “Job sent and sanctified them . . . and offered burnt offerings . . . for Job said, ‘It may be that my sons have sinned, and cursed God in their hearts.’ Solomon with all his wisdom wrote, “The day of one's death is better than the day of one's birth. It is better to go to the house of mournirig, than to go to the house of feasting, for that is the end of all men” (Ecc. 7:1-2). Job actually cursed his birthdate saying, “Let the day perish wherein I was born, and the night in which it was said, ‘There is a man child conceived”’ (Job 3:3). The Jews in Christ’s day knew God’s law forbids celebrating birthdays. Josephus, the Jewish historian of the first century, declares: “Nay, indeed, the Law does not permit us to make festivals at the births of our children” (Against Apion, book 11,26). No Definite Date for Jesus’ Birth! Do you know that no mention of the date of Jesus’ birth as a human being is found anywhere in the Bible? The traditional celebration of December 25 does not come from the Bible, but from paganism! The day of Jesus’ birth is unknown-- although many believe it was around the time of the Festival of Boothes. But the day of His death is well known (Nisan 14, A.D. 31). Jesus asked His disciples to observe this day annually -- “in	remembrance of Me.” It is to show His DEATH -- not	His birthday or His resurrection -- that	Christ commanded His disciples to continue the annual observance of the Passover meal with the symbols of unleavened bread and wine (Luke 22: 17,20). The original passover lamb was slain as a type of Yeshua's great sacrifice. The apostle Paul explained, “Christ OUR PASSOVER is sacrificed for us” -- and	then went on to explain further the proper manner of our annual observance of the day the Saviour died as our Passover Lamb (I Cor. 5:7,8). What a contrast to the modern custom of birthday celebration! Not a single mention is ever made in the Bible of the exact date in terms of the month and day upon which any individual was born! Think of it! Isn’t this strange when compared with the modern custom of taking pride in reaching another birthday? We live in a world today that is geared to the Roman calendar. We remember the date of our birth, pay our taxes and have our tombstones engraved with the day we die -- all	in accord with a pagan Roman system of calculating time. “But isn’t our Roman calendar of Christian origin?” many ask. “Doesn’t it have the approval of almost all Christian sects?” The Roman calendar in use today is pagan in origin! It begins with January 1 in honor of the birth of the new sun! The sun is now dropping lower and lower in the southern portion of the sky. The days are becoming shorter, but on December 21 (according to the present Roman calendar) the southward movement stops and a new year begins. January 1 is in honor of the return of the sun! As our ancestors worshipped the sun, so our people today drink toasts to this pagan new year and make vows -- New Year’s Resolutions -- in	celebration of the return of the sun to its northern course. Where do you find such a custom sanctioned in the Bible? History answers: “Our (Roman) calendar is not Christian in origin. 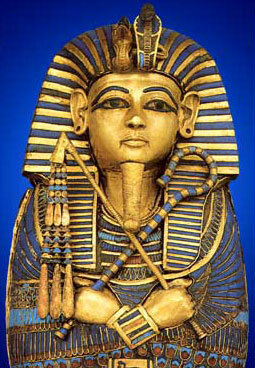 It descends directly from the Egyptians, who originated the 12 month year, 365 day system. A pagan Egyptian scientist, Sosigenes, suggested this plan to the pagan Emperor Julius Caesar, who directed that it go into effect throughout the	Roman	Empire	in	45	B.C. As adopted it indicated its pagan origin by the names of the months -- called after Janus, Maia, Juno, etc. The days were not named but numbered on a compli- cated system involving Ides, Nones, and Calends. It was not until 321 A.D. that the seven-day-week feature was added, when	the	Emperor	Constantine	(supposedly)	adopted	Christianity. Oddly enough for his weekdays he chose pagan names which are still used.” (From “Journal of Calendar Reform,” Sept.1753, footnote p. 128. Italics ours.) Further study brings one to the realization that the entire Roman calendar is of pagan origin with the single exception of the seven-day week feature. Ironically, the “Journal of Calendar Reform” would have men give up this feature also by adopting their World Calendar. This proposed calendar contains one day each year (two in leap years) that is not counted as a day of the week. The seven day cycle of the week which has persisted since creation would then be broken. The World Calendar has features which look right to men, but in adopting it the one remaining feature of keeping time God’s way -- the weekly cycle -- would be lost. It would be a totally heathen calendar. In following this Roman calendar in our daily lives we make use of the pagan names attached to the days of the week and months of the year. Sunday, Moonday, Tiwsday, Wodensday, Thors- day, Friggasday, Saturnsday are all titles given by the pagans to the seven days of the week. The single designation given in the Scriptures was the term Sabbath to the seventh day of the week; all others were termed first day of the week, second day of the week, etc.We are obligated to make use of this Roman Calendar in this present world, but we need to recognize it for what it is. Consider the tactics of our arch-enemy, Satan. His work of deceptions pervades every field of endeavor, every practice, every custom, everything we deal with in life. Think back. Doesn’t January 1 completely overshadow in our minds the date God ordained for ancient Israel that a new year should begin. Probably only a handful of us took note of the first lunar crescent after sunset on the evening of March 21 (or later) that a new year was beginning. The visual calendar given by God to Moses has been preserved in the pages of the Bible. “This month shall be the beginning of months: it shall be the first month of the year to you” (Exodus 12:2). What Is the Correct Attitude Toward Birthdays? What is the correct evaluation of the day upon which we were born? The Bible merely states that “the day of death , ..is better ...than the day of one’s birth” (Ecc. 7 :1). Yet our birth into this world seems to be an important day to us. Yes, the day we first drew a breath of air and began this physical life does have some importance. But we need to understand why the day of death is BETTER. How can this be? What wisdom had God given to Solomon to see a principle here that escapes us? Notice the answer from the apostle Paul. Paul writes, upon nearing death, “I have fought a good fight [in overcoming his human nature in this life], Ihave finished my course, I have kept the faith. Henceforth THERE IS LAID UP FOR ME A CROWN OF RIGHTEOUSNESS, which the Lord, the righteous judge, shall give me at that day (the day of Christ’s return: the day of the resurrection of the dead): and not to me only, but unto all them also that love his appearing” (I1 Tim. 4:7,8). The day Paul began his carnal life as a baby could hardly be compared in importance with the day he, at death, made certain his reward by enduring the problems and trials of a Christian life to the end! Consider another aspect in which death is given great importance. “If we have been planted (referring to our immersion in water at baptism) together in the likeness of His (Christ’s) death, WE SHALL BE ALSO IN THE LIKENESS OF HIS RESURRECTION. . . buried with Him by baptism into death . . . we also should walk in newness of life” (Romans 6:5, 4).The day of our baptism is a day symbolizing the death of our carnal self and the beginning of a new life. When one repents, turns to God’s true Way, receives God’s Spirit and begins a new life --Isn’t	this day more important than the day of his birth as a human baby? If a man persists through his Christian life to “crucify the self,” to put to death the carnal nature he was born with, and to grow with the new nature imparted to him at baptism-- isn’t	the day of his death, when his time of trial and testing is over, more important than the day of his baptism, when that newly imparted nature from God was just beginning to grow? that is begotten AT BAPTISM to grow for the remainder of our time of trial and testing--a	life that will be born AT THE RESURRECTION! Birthday Observance With a Biblical Calendar? The calendar given by God to Israel in the time of Moses was not at all adapted to birthday celebrations. Have you pitied the “unfortunate” individual who was born on February 29 and could receive gifts and congratulations only once every four years? This single irregularity of February 29 in the Roman calendar affects but about one individual in 1461. But the irregularities of the Jewish calendar would affect the birthday observance of one person in every eight! The calendar in use by the Jewish people today is different from the one God gave to Moses for the children of Israel. It is calculated rather than visual. But both the visual and calculated calendars create problems for those who celebrate birthdays. For instance, the Roman calendar has a single month, February, that varies in length according to a simple one year in four pattern. The calculated calendar that Jews use has three months that vary in length from 29 to 30 days after a rather complicated pattern. Three times as many people are affected. A still greater deterrent to annual birthday observance is the insertion of a 13th month in the 3rd, 6th, 8th, 11th, 14th, 17th, and 19th years of a 19-year cycle. Imagine the confusion of attempting to schedule birthday parties! It is true that some Jewish people, following pagan customs, attempt to use this ancient calendar to observe their birthdays. A rather intricate set of human rules governs whether to move the celebration ahead or back one day, or back one month in the absence of the 13th month. Differing regulations are applied and the practice is not uniformly followed by all. If we try to celebrate birthdays using a visual Biblical calendar, each month can vary from 29 to 30 days in any given year. That means that about 6 out of every 365 people each year will not even be able to celebrate a birthday party. What wisdom prompted God to give mankind such a calendar? It certainly discouraged the practice of observing birthdays and ocher anniversaries! The net result was to hinder birthday celebrations. God’s people certainly knew the date of their birth, but they kept track of their age by calendar years, not birth dates. But for those who understood, the whole purpose of life was to prepare for and look forward to a new birth, to a resurrection from the dead. Job looked forward to the time of his re-birth; “I know that my redeemer [Christ) liveth, and that He shall stand at the latter day upon the earth [referring to Christ at His second coming soon to occur): and though after my skin worms destroy this body, yet in my flesh shall I see God” (Job 1-92:5, 26). A better rendering of the Hebrew would be “yet apart from this flesh shall I see God.” Also in chapter 14, verses 14 and 15, “If a man die, shall he live again? all the days of my appointed time will I wait, till my change come. Thou shalt call, and I will answer thee [referring to the time when Christ will call, and all that are in their graves will hear His voice and come forth in a resurrection]: thou wilt have a desire to the work of thine hands.” Instead of looking backward to a physical birth into this temporary life where we are composed of dust, this man understood the true values of life and looked forward to a re-birth into life eternal as spirit beings and members of the Kingdom of God. The patriarchs are still in their graves looking forward to the only birthday that really counts. A child’s life does not begin with birth. Rather, at birth the flesh is about nine months old and about ready to begin its training in the mastery of emotions, lusts and desires under the guiding hands of the parents. Japanese count a man’s age from the time of conception rather than birth. A single Greek word is translated both BORN and BEGOTTEN in our Eng- lish translations of the Bible according the context. No distinction is made of the moment of birth. The single word fathered could have been used to carry the intended meaning in English. Pre- serving one’s genealogy was important, but the date on which one was born was considered of little account. Our present mortal existence is but one of dust kept alive by the breath of life, the oxygen we breathe in and which our bloodstream carries to all parts of the body. The moment of conception and of the birth of this mortal life are of little importance compared to our new birth into God’s kingdom. In sharp contrast to the complete absence of any mortal man’s birth date in the Bible, we do find the command to commemorate the day which pictures the first “harvest of souls”-the	time when immortal Sons of God will be born! This day pictures not only our spiritual birth- day but the day of conception as well! We Must Yet Be Born Again! “Flesh and blood cannot inherit the kingdom of God.” “You must be born again.” For Christians the moment of conception of this new life is the time they receive God’s Spirit as a begettal to eternal Spirit life. Now turn to Acts 2. For many in 31 A.D., the time of spiritual conception was the Day of Pentecost recorded in Acts 2. For some it was then three years after their repentance and baptism; for others only months or days. It is not our baptism day then that is to be remembered year by year, but the Day of Pentecost which is set aside as the memorial of conception of all God’s children, the moment of the beginning of their Spiritual life. But conception only begins our life. We must yet be born! Paul writes, “My little children, of whom I travail in birth until Christ be formed in you” (Gal. 4:19). We must grow from con- ception, from the moment God implants His Spirit in us. We must be born immortal. That moment, then, will be the day of our new birth, This is the day of birth Satan would like to cover up by emphasis on the day of your birth into this physical life. It is the Feast of Pentecost -- which pictures the first harvest, the spring harvest -- that	pictures the time Christians will be reaped into the Kingdom of God and freed from this mortal earthly body in which they have been developing and growing to be like God. For those Christians in their graves it will be a moment of awakening. They will come up out of their graves, once children of the earth, but now children of God! This is the birth you should be looking forward to -- not	looking backward each year to the time of your entry into this existence from the dust!